This website traces the ancestry of three Spencer children of East Greenwich, Rhode Island, back twelve generations, through the founders and early settlers of East Greenwich, then all the way back to England! The children, Edith Anna, (born June 11, 1898 died Dec. 8, 1991) , John (“Ed”) Edward (born Aug. 15,1904 died April 26, 1988) and Audrey Mae (born March 19, 1912 died March 11, 2007) are the children of William Joseph Briggs (aka J.B.) Spencer and Mary Jane (née Vaughn) Spencer. Edith Anna, John “Ed” Edward and Audrey Mae were born and spent their childhoods on the Spencer homestead. This Spencer homestead, purchased by their ancestor William Spencer in 1750, was located on Middle Road in the western area of East Greenwich, Rhode Island. The children however would be the last Spencers to be born there. Their father, William J.B. Spencer sold the farm In 1922 and moved the family to Anthony, a village within the nearby town of Coventry. 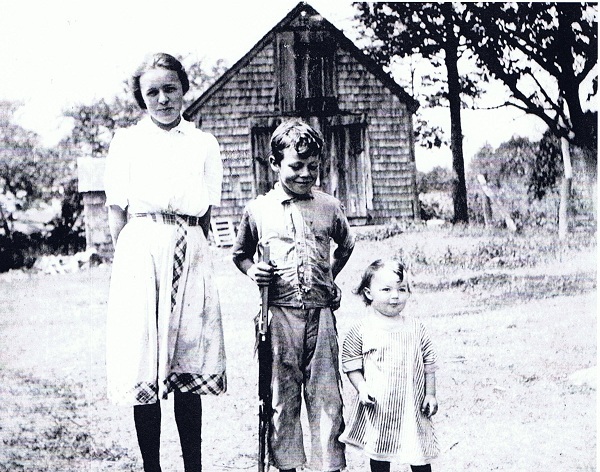 Edith Anna, John Edward and Audrey Mae Spencer (@1915) in front of shed on Spencer Farm, Middle Road, East Greenwich, R.I.
Because of Rhode Island’s emphasis on “Separation of Church and State” early colonial Rhode Islanders were each buried in their own family cemetery on their own land, instead of in a Church yard. If a descendant knows where their ancestor is buried, they can often deduce where their ancestors property was. Likewise, if they know where their ancestors’ property was, they are often able to locate their graves. The Spencer family historical cemetery (AKA East Greenwich No. 9) is located on the south side of Middle Road just west of Partridge Run in East Greenwich. The land was originally purchased in 1750 by William and Mary (née Manchester) Spencer. Seven generations of their descendants are buried there. The “over-back” cemetery, (also known as the Straight Cemetery) was used prior to the Spencer family historical cemetery. It is on the west side of a relatively new subdivision street called Partridge Run. 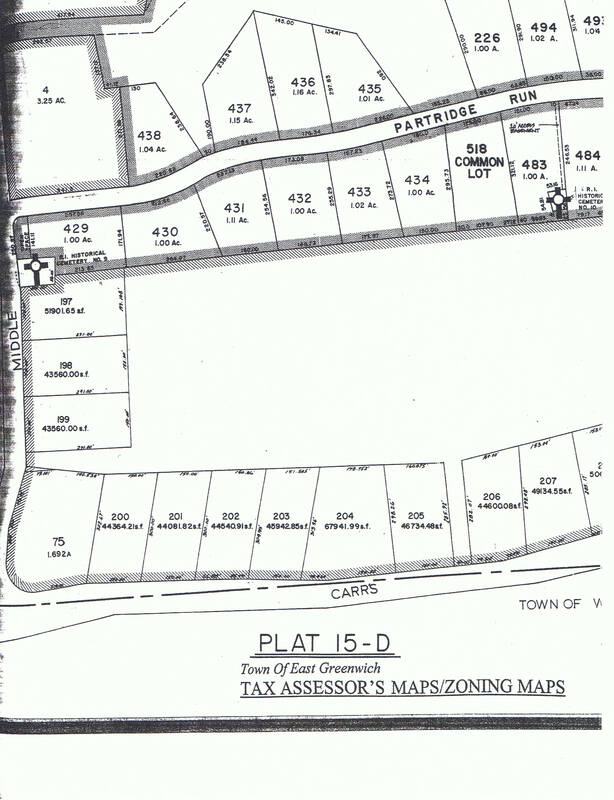 The zoning map illustrates a ten-foot wide easement from Partridge Run to the burial grounds. William and Mary (née Manchester) Spencer are buried in this cemetery. The cemetery is located approximately 250 feet from Partridge Run. The “over back” cemetery is over the stone wall (to the east) and back (1,383 feet to the south) of the Spencer family cemetery on Middle Road. The burial places of William’s parents, John and Audrey (née Green) Spencer, and his grandparents, William and Elizabeth (née Rice) Spencer are unknown to the author of this webpage at this time. More research is needed. Thomas F. Spencer of Eton Secno, England, in 1433. Robert Spencer, of South Mylles, Bedfordshire, later St. Albans, England. Married Ann Peck (Peake, Peak, Peek, Pack). John Spencer, South Mylles, Bedfordshire 1533 at St. Albans, later in Edworth, Bedfordshire, England. Married Christian Baker. John Spencer, Jr., of St. George Parish, Edworth, Bedfordshire, England. At Edworth June 9, 1588 married Anne Lymer or Limer and died June 16,1560. Michael B. Spencer, of Edworth, and Statford Court, England. Gerard Spencer, baptized May 20, 1576 at St. Mary’s Parish, Statford, Eng. Married Alice Whitbread and they had eight children. Web site author’s research into the three children’s ancestors in England was aided by Princess Diana’s brother Charles’ book, The Spencers, a Personal History of an English Family, and other sources acknowledged in this website. 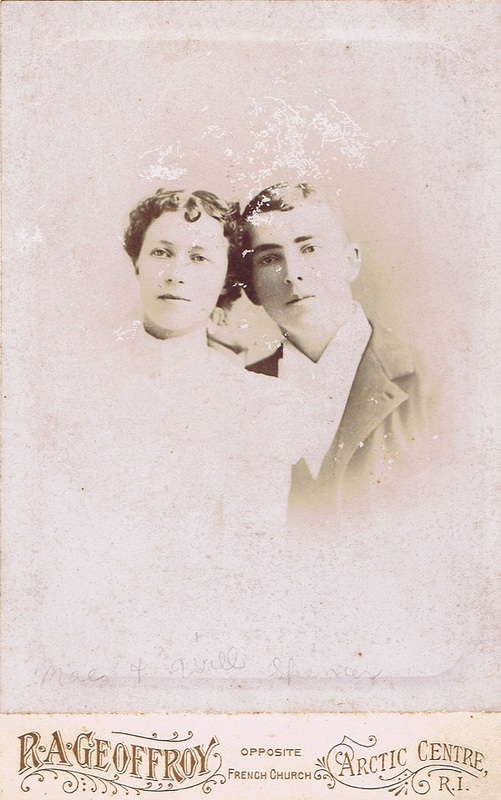 William J.B. & Mary Jane (née Vaughn) Spencer, the parents of Audrey Mae, Edith Anna & John Edward (“Ed”). The website author has been able to substantiate the above genealogical Spencer direct line by finding multiple references to this family line. The only discrepancy is one twentieth century researcher says there is “no proof” that the first John in East Greenwich, Rhode Island was the son of Michael but John was thought to be the nephew of Michael. However, multiple references have John as the son of Michael. Click the above page “Back to England” for more information on the genealogy. In the 15th century, “Spencers were among the wealthiest sheep traders in Europe.” Pretty Princess Diana, the People’s Princess in England, and the Spencer’s of East Greenwich, Rhode Island, shared the same ancestry until 1476. At that point, Diana descends from the son John, and the Spencers of Rhode Island descend from the son Thomas. Winston Spencer Churchhill’s father, Randolph Spencer Churchhill, was also in this same Spencer ancestry. 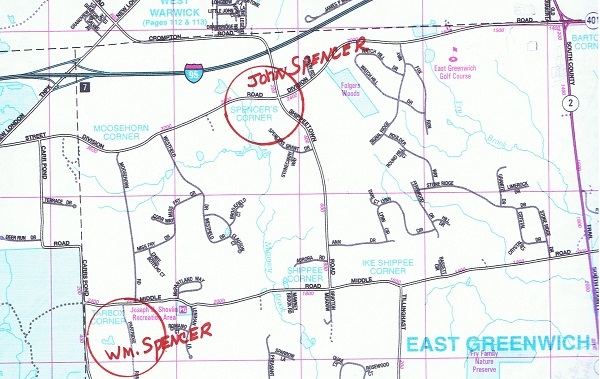 The first John Spencer in East Greenwich, Rhode Island was granted land (1677) by the King of England. John was the first to sign the original grant-incorporation of East Greenwich and he was the first town clerk. Early town meetings were held at his (and Susannah’s) home. Their son, Thomas, was the first English baby born in East Greenwich, R.I. Their son, John, married Audrey Green in 1677 and two-hundred and forty-five years later, her great (7 times) granddaughter, Audrey Mae, the carrier of this oral tradition, was born and named after her. During the American Revolution (1776), John Spencer was a minuteman in the war. Tragically, in October of 1777, John’s father and older brother died of Smallpox, so John’s mother wrote George Washington to have her only surviving son to come home and work the farm. Washington said no, so John’s mother sold 20 acres of the farm to hire a substitute. 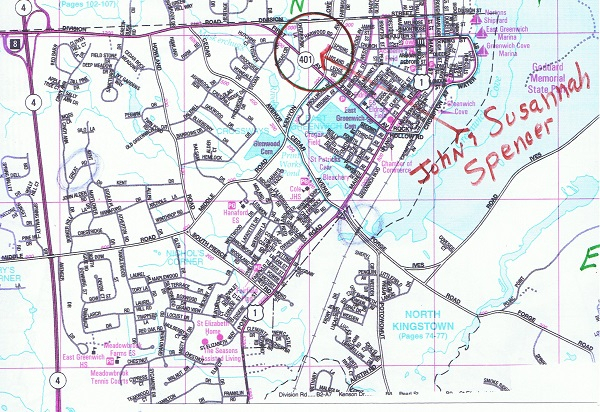 Years later, John’s son, Richard (“Deacon”) bought back the 20 acres of land. John (“Ed”) Edward’s, Edith Anna’s and Audrey Mae’s paternal grandfather, John Johnson (“Ace”) Spencer, was in the “1st Regiment, Rhode Island Cavalry, a cavalry regiment that participated in the American Civil War. The regiment was organized between December 1861 and March 1862 at Pawtucket as the 1st New England Cavalry.” He joined for duty and enrolled in Lt. Greene’s Co., 1 Reg’t New England Cavalry on December 11, 1861. His muster-out roll date was December 19, 1864. He was a Yankee prisoner of war in Virginia until he was paroled in Lincoln’s exchange of northern and southern prisoners before the program was abruptly ended. John Johnson (“Ace”) Spencer brought his own horse with him when he went into the American Civil War. Having grown up on the Spencer farm, he was an excellent horseman. His rank as Private in the Civil War included his classifications as Farrier, Teamster and Blacksmith. 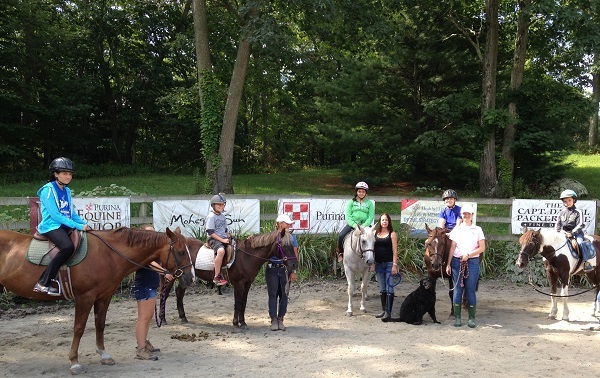 Keeping the tradition alive in the 21st Century, five of John Johnson Spencer’s great, great, great-grandchildren are learning to ride horses and taking lessons in East Greenwich, Rhode Island. 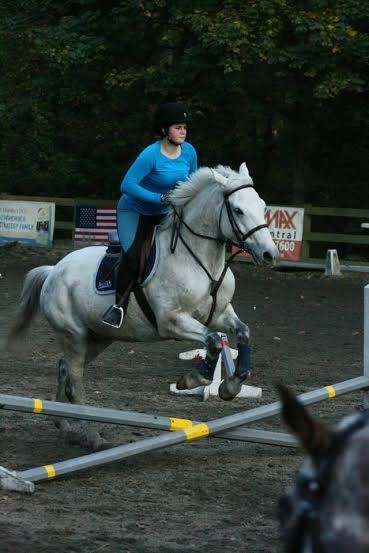 John Johnson (“Ace”) Spencer’s great, great, great-granddaughter, Jessica, a university student, following in the Spencer tradition is also an excellent rider. Historians and Spencer descendants, if you have any additional information, please add a comment to this to this web site and the web site editor will add this to the site. Thanks! Vaughn, Spencer, Walton, and MacDonald Press, Hemet, California, U.S.A.